Growth – The Water You Save is Not Used for Growth. Can the water we conserve everyday be used for growth - to build more houses or businesses? The answer is no. Some people mistakenly believe that when our residential customers use less water through conservation, the water saved is used for growth. That is not what happens. The Truckee River Operating Agreement (TROA) requires that TMWA use conserved water to increase drought storage availability and enhance instream flows in the Truckee River for wildlife purposes. Reselling of conserved water to serve new houses does not occur. Where does the water come from for new growth? TMWA holds water rights dedicated to serving each business or home. New developments must acquire water rights from a willing seller. Anytime someone wants to build a house, a subdivision, or a business, they must bring existing water rights to TMWA. In most cases, agricultural irrigation rights are purchased by developers and are converted to municipal use for new projects. The amount of Truckee River water available for use in the Truckee Meadows was determined by a 1944 court decree and has not changed. When people who own irrigation water rights decide not to use them any longer, they can sell them like any other real property. If they are sold to a developer, the developer must then legally change the use to municipal purposes and transfer them to TMWA so they can serve new customers There is no increase in the amount of water that can be diverted from the river. The only thing that changes is how the water is used. Does growth pay for growth at TMWA? Yes, it does. The development community pays for all new facility and water rights expenses related to growth when they want to build a new project. The TMWA Board of Directors instituted this policy shortly after TMWA was formed in 2001. Growth is paying the full cost of new facilities to provide new service. The fee that developers pay includes the cost of new water mains, pumps and tanks, plus expansion of water treatment plants. The development community has agreed to this policy, which ensures that existing customers do not pay for new facilities to serve new development and new customers. In addition to new facilities, development funds: inspection charges and engineering services, as well as $1,830 per acre-foot of demand to pay for retrofitting flat rate customers to meters. Thus, TMWA’s existing customers do not pay the cost for growth or meter retrofit. These fees and charges are reviewed regularly and updated based on the most recent facility plan, construction and other cost information. What is TMWA's role in growth in our community? Local governments set the communities’ direction on growth. TMWA is a water provider and a facilitator to serve local government in managing and developing existing or future water supplies and resources. We cannot deliver more water than is allowed by water rights and drought reserves -- for any purpose, including growth. The community sets the course for growth through regional planning and local government directives. If anyone would like to have input in the issue of growth, contact your elected representative and/or the planning commissions. Approximately 45,000 acrefeet of Truckee River and creek water rights remain available for future conversion, plus an additional 8,000 acre feet of groundwater from Fish Springs Ranch. Total converted irrigation and groundwater water rights available for use in the Truckee Meadows: approx. 111,000 acre-feet. TROA allows for two to three times more storage than previously available. Visit tmwastorage.com/reserves for both historical and current storage levels. 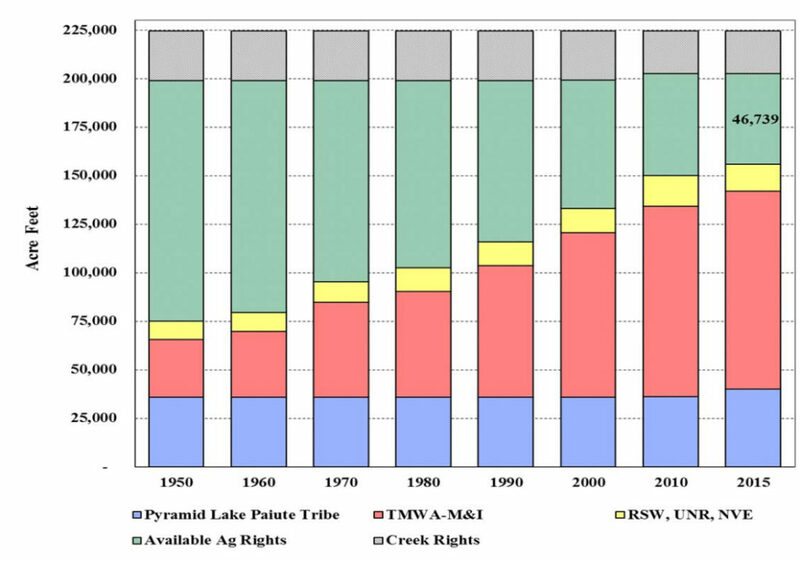 Number of new Truckee River water rights: None since 1944. Investment in new water facilities: $75 million since 2002 paid by developer fees.